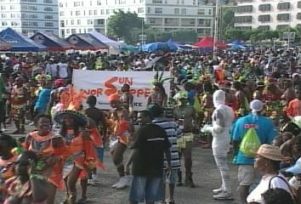 Monday, July 23, 2007 – Two Government Ministers have hailed this year's Carnival celebrations a huge success. The Ministers of Culture and Tourism both spoke with the GIS following the climax of Carnival celebrations last week. Minister for Education and Culture Honourable Arsene James, for his part, commended highly, the level of public support for all of the activities. Meantime Minister for Tourism Senator the Honourable Allen Chastanet said, as one of the leading cultural events in the country, every effort should be made to advance carnival's development. He announced that a three year financial plan has been put in place to allow for greater expansion and development of the island's main cultural show-piece. According to Mr. Chastanet, much of the investment for carnival this year was to improve overall production of the event. The Tourism Minister is of the opinion that saint Lucia has the potential to develop a unique product fitting for the international market. He said the process has begun and the level of local participation is clear evidence of that direction. Government pumped over 1 Million dollars into the 2007 carnival festivities.